Miguel Penabella drives faster when the sun goes down. Daytime traffic clogs Los Angeles highways with bumper-to-bumper congestion, exacerbated by impatient commuters and gaudy Starline tour buses that cut you off in their beeline for the exit ramps. At night, the streets of LA become a very different place. Past nine or ten o’clock, the traffic begins to loosen its chokehold on these streets. By midnight, Los Angeles is all but a ghost town; highways and downtown avenues once gridlocked under the sun enjoying a spooky quietude. My favorite memories of driving around this city occur at night. During one trip on the 101 freeway, I saw a pristine Acura NSX rocket down the road like it was breaking the land speed record, a feat that would be unimaginable in the slow crawl of the day. Leaving downtown, I once hopped in a supercharged tuner car that doubled as an Uber, blasting across empty straightaways with trap music raging. I also recall hanging out in alleyways around Koreatown past midnight, talking with friends parked inside a car or leaned over through an open window under the glow of a streetlight. While Ghost Games’s 2015 reboot Need for Speed takes place in the fictional Ventura Bay, the look and feel of its world parallels the experience of driving around Los Angeles after hours. More than any other game I’ve played, Need for Speed perfectly captures the sensation of an endless night out to town: boredom, adventure, spontaneity, melancholy, and elation. Despite complaints regarding the game’s lack of a daytime cycle, previous Need for Speed entries have also factored the time of day as an aesthetic choice. Underground’s similar neon-drenched nighttime cityscapes or Most Wanted’s warm orange glow reflect these games’ particular scene of racers, from the former’s illegal tuner culture to the latter’s backdrop of criminals in broad daylight. This game’s conscious decision to remain shrouded under cover of darkness warrants praise for the sense of freedom it channels. Need for Speed is less a racing game than it is a game about spending a weekend night cruising, vibing, and hanging out, free from the confines of traffic or work that the daytime brings. 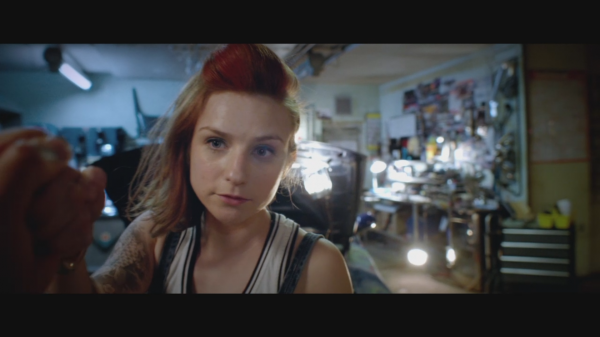 These feelings are reinforced in the full-motion video (FMV) cutscenes of the game, which are crucial to the tone and loose narrative of a night out. These FMV cutscenes both evoke the narrative presentation of older games like the original Most Wanted and Undercover, while also subverting the dull self-seriousness of these prior titles. Gone are the combative characters and vague criminal intrigue, instead replaced by an endearing self-awareness conveyed via goofy acting and a wholesome plot filled with easy smiles. The presence of real human actors simply enjoying themselves and the company of friends lends the game a sense of non-cynical earnestness rather than a shoehorned crime plot as in Carbon or The Run. Campy performances from actors Faye Marsay (of Game of Thrones and Black Mirror fame), Adam Long, Christina Wolfe, Howard Charles, and Leo Gregory provide surprisingly warm, friendly faces that humanize a genre that often risks soullessness. Unlike other racing titles that emphasize individualistic competition and belligerent foes, Need for Speed embraces quick friendships and collective triumph. Within five minutes, the game introduces players to the manic young racer Spike and his fellow ragtag crew, ultimately initiating the unspoken player-character into his friend group. These cutscenes are filtered through the first-person perspective of the player-character, which means that the human actors look into the camera to address the player directly. A sense of intimacy thus arises: not only is the character welcomed into the crew, but the player is also folded into this newfound friendship. The silent protagonist interacts with other characters using their primary and seemingly only mode of communication, a fist bump. This casual camaraderie extends beyond the cutscenes and into the free roam around Ventura Bay, as characters can leave voice messages and texts for the player to receive. More often than not, these messages are invitations to further spend time with one another outside the contexts of racing. Like an endless night in which you and other friends are bored and wander the city for something to do, Need for Speed channels the feeling of urban aimlessness. While cruising around an empty city, players can snap pictures in front of murals or blast music from the car. Cutscenes find familiar faces bar hopping, playing pool, eating at diners past midnight, or lounging on sofas. Friends like the tomboyish mechanic Amy or the cocksure drifter Manu filter in and out of cutscenes and voice messages, as though departing to other get-togethers in the city before reconvening with the player elsewhere. Rather than amplify the stakes of a central conflict, Need for Speed is fully content with retreating to the coziness of a diner like in Edward Hopper’s Nighthawks. 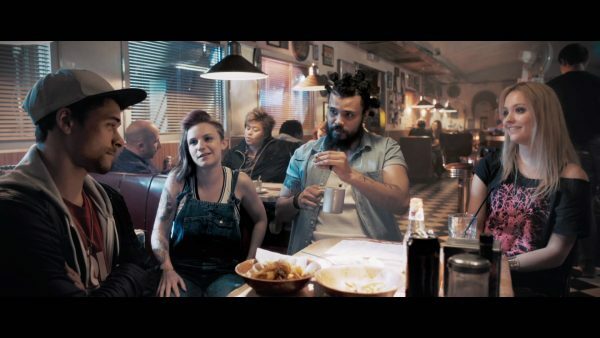 In these locales, characters summarize the cool things that happened during the course of a night, much like a drunken trip to Waffle House or In-N-Out Burger or another greasy restaurant to soak up a night of stories and alcohol. The perpetual night of the game makes narrative sense. The daytime is the hangover, and the sobering reality of returning to work or school. One imagines that the characters of the game have mundane day jobs, but the night allows them to come alive, finding temporary reprieve in casually racing and drifting alongside dive bars and burger joints. What all this means is that Need for Speed, despite earlier claims in the series, is a refreshingly low stakes game. Your racing crew isn’t an elite team but simply comprises fans who pine to meet professional drivers and tuners like Ken Block or Shinichi Morohoshi. When a friend calls the player to join a race, oftentimes it’s simply because they’re bored and looking for something to do, as when Amy messages: “need to see a human face.” Drift trains compel players to slide around hairpin, mountainside switchbacks in glorious synchronization with a line of other cars, racking up a higher multiplier the closer you are with fellow drivers. And in time trials, which are typically solo affairs in other games, your buddy accompanies you not to compete against but to ride along behind like an entourage. Some races aren’t even meant to be won, but simply ask the player to “run the drift contest” or “run the circuit race” without necessarily finishing in first place. Such events may seem antithetical to competition or challenge, but it neatly fits with the laid-back tone of leisurely cruising around a city without the stress of outperforming others. When racing head to head with a crewmember, such events are enacted in good fun without animosity. “That was dope,” Amy remarks even after losing an event, reinforcing companionship above competition. And while police cars may interrupt these nighttime drives like cops busting a party, even law enforcement is markedly toned down from the brashness of previous games. In addition to racing and evading cops, Need for Speed is a game about navigating relationships. Indeed, Need for Speed often has a grasp of interpersonal relations with surprising nuance and thematic strength for what’s ostensibly a straightforward racing game. For instance, crewmembers Amy, Robyn, and Spike chat together on the phone to discuss how to address some casual sexist microaggressions spoken by Manu. A model of a good friend, Spike agrees to confront him about it because Robyn feels uncomfortable with Manu’s behavior. This conversation is interwoven among bouts of driving, replicating the kinds of mundane discussions that healthy friendships are built on: mutual trust and constant communication. Later in the game, the player bests the achievements of Spike’s hero Magnus Walker (another real-life automobile personality), prompting a jealous cold shoulder from Spike. The player attracts the attention and glory of fans, but Spike, normally a buoyant and lively jokester, betrays a fear of missing out when sidelined from the spotlight. When he mouths off to the player-character and drives off alone in a cutscene, a concerned Robyn calls the player during free roam and urges, “Don’t let him be alone tonight. Watch his back, yeah?” Need for Speed’s treatment of its characters is wholesome and portrays a healthy attitude towards friendship, in which friends look after and uplift one another. The game refuses to turn Spike into a cheap antagonist in a more melodramatic storyline, but in keeping with the low stakes of the game, instead has the character bury the hatchet when these characters come together at a bar to resolve the issue like rational people. The game shrugs off individualistic glory; Spike remarks that a victory from one crewmember symbolizes a victory for all. There are always more weekend nights to come. At its core, Need for Speed has a melancholic yearning. By structuring the game’s events as invitations from friends to hang out and drive, players open their phones and maps in an effort to reconnect with familiar faces and keep alive healthy friendships. Cruising around the city alone is a downcast state that reminds players of the greater fun that could be had with companions. When pulled over to load up the city map (since the game cannot be paused), the music on the radio softens to a muffled din as though we’ve stepped out of the car and are hearing music from another space. It’s one of the most curious design choices in the game, and it encapsulates the themes this game is pursuing. The muffled music evokes the moment when stepping out of a party to take a phone call, have a smoke, or make out with a friend in the private space outside of a crowd. The feelings it evokes are nostalgic, and bittersweet. In this intimate, liminal space amidst the frenzy of a weekend night, you have room to sit and relax, and to simply appreciate the moment. When you’re ready, you start up the car or reenter the party, and the music shifts back into focus. And back into the night you return. Miguel Penabella is a freelancer and comparative literature academic who worships at the temple of cinema but occasionally bears libations to videogames. His written offerings can be found on PopMatters, First Person Scholar, and Unwinnable, and he blogs on Invalid Memory.